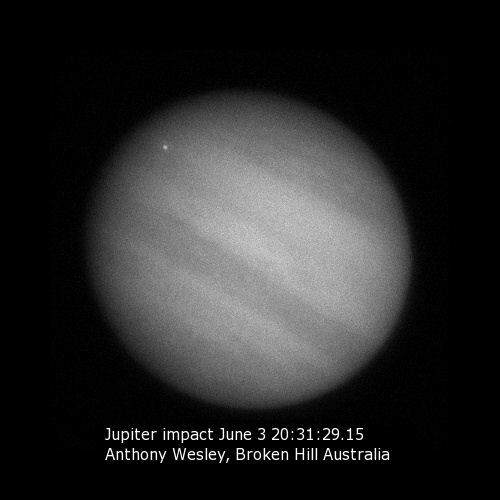 Amateur astronomers Anthony Wesley (Australia) and Christopher Go (Philippines) have independently observed an impact flash on Jupiter. 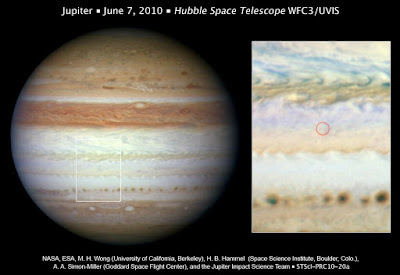 According to their images and videos, the impact flash happened at 20:31 UTC of June 3, 2010 and lasted only few seconds in Jupiter's faded south equatorial belt. The alert was first launched by Wesley and soon after confirmed by Go who happened to imaging the planet at the same time. Wesley suggests that the impact "doesn't seem to have left any mark, so it probably burned up in the upper atmosphere before it reached the cloud deck. There were no visible remains at the impact point for the next half hour or so, until sunrise put an end to the imaging." According to S&T website: "The flare occurred at longitude 248.8° in Jupiter's System I, 342.7° in System II, and 159.4° in System III. The latitude is 16° south. This region should be visible from about 4:00 to 6:30 June 4th UT, favoring observers in Europe and Africa when Jupiter is up before dawn. The impact site will return to good view about every 9 hours 56 minutes thereafter." Major telescopes will be pointed on the area as soon as possible. So it's likely that we'll have more info available in the next few hours. 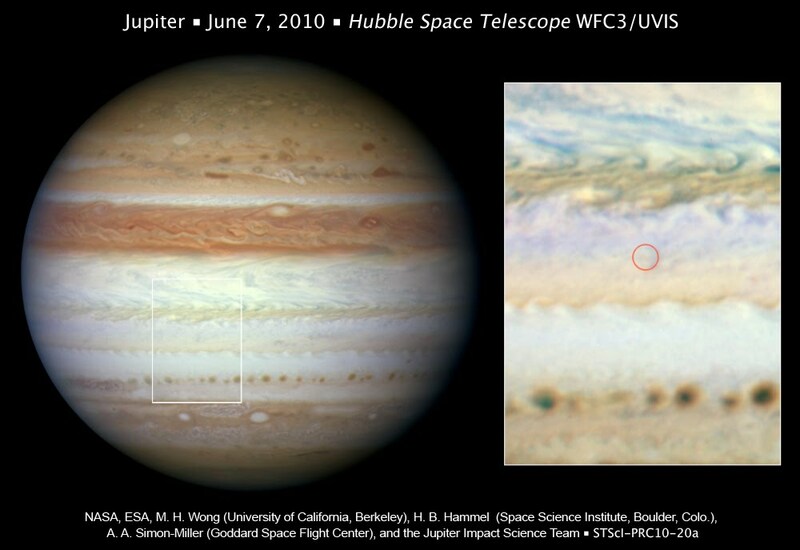 Anthony Wesley was also the discoverer of the impact scar on Jupiter on July 2009. Unlike previous impacts, Hubble imaging of the June 3rd impact site revealed no debris scar. The impact flash came from a giant meteor burning up high above Jupiter's cloud tops. The space visitor did not plunge deep enough into the atmosphere to explode and leave behind any telltale cloud of debris, as seen in previous Jupiter collisions. Image Credit: NASA, ESA, M.H. Wong (University of California, Berkeley), H.B. Hammel (Space Science Institute, Boulder, Colo.), A.A. Simon-Miller (Goddard Space Flight Center), and the Jupiter Impact Science Team.